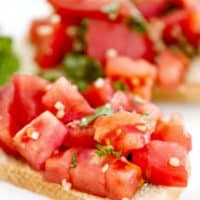 Easy Bruschetta Recipe - A 5-minute appetizer full of flavor! This Bruschetta recipe causes a bit of an uproar in my house. I love its simplicity and fresh flavors, but it’s such a simple recipe that, once tomatoes are in season, my husband asks me to make it every. single. day. Not that I mind, since it’s one of my favorite appetizers, too. But we can only grow so many tomatoes in our small garden. One thing we do agree on is that it’s a quick and delicious nosh that pairs well with a cold glass of Pinot Grigio or Chardonnay. When made with entirely home-grown ingredients it’s like tasting summer. Seriously. I hate to admit it, but I mispronounced “Bruschetta” for the longest time. No one I knew corrected me because they mispronounced it, too. Like Panzanella Salad, this is another recipe dating back centuries, to a time when people baked many loaves of bread at once then ate them for a week or more. After the first few days, those fresh loaves grew stale and hard. With all of the work required to make them, they were too precious to discard, so they came up with creative ways to use them. The word “bruschetta” comes from the Roman verb bruscare, which means “to roast over coals.” The name alone signifies that the bread should be warmed in some way, though whether you pop slices in the toaster or brush them with oil and grill them is up to you. Personally, for this Bruschetta Recipe, I broil the oiled slices for a few minutes in the oven — just until the tops are light golden brown. Whatever method you use — toast, grill, or broil — giving the bread a bit of a char lets it hold up under the weight of the herb-seasoned tomatoes. You’re welcome to skip this step (though you should still rub the slices with garlic) but don’t be surprised if the topping slides off after your first bite. 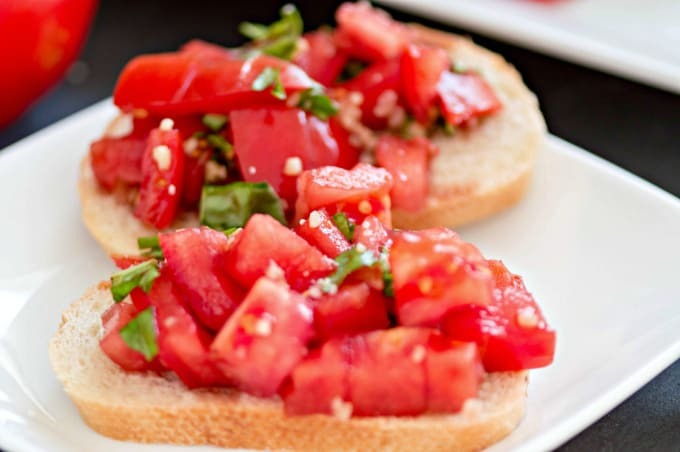 In its most basic form, which originated in Tuscany, Bruschetta is merely toasted, garlic-rubbed bread. Neopolitans prefer to top theirs with tomatoes, as I do in my recipe. Serve it however you like! Once made, the topping in my Bruschetta Recipe keeps well in the refrigerator for two days. After that, the herbs start to look a bit rough but, if you’re not picky about appearances, you can still use it. Italian Chicken: Season boneless, skinless chicken breasts on both sides with Italian herbs, salt, and pepper. Add leftover bruschetta recipe topping and some shredded mozzarella. Bake in a 350°F / 177°C oven for 30 minutes and serve. Bread Salad: Tear leftover Italian bread into bite-sized chunks and stir it into the remaining Bruschetta Recipe toppings. Let the bread soak up the juices then add it to a green salad. Pizza: Prepare your favorite pizza dough and spread it with the remaining Bruschetta Recipe toppings. Add slices of fresh mozzarella — or sprinkle on grated mozzarella and Parmesan — and bake until done. Now, I’m not going to encourage you to plant your garden based entirely on my Bruschetta Recipe. If you do already have the ingredients growing in your garden, so much the better! But what if you don’t have a garden, or you get a craving for Bruschetta in the middle of winter? You can get the same vine-ripened flavor from grocery store tomatoes (which are picked before they’re actually ripe) by storing them on your counter, NOT in your refrigerator. Place them stem-side down on a windowsill for 2 to 3 days until they are soft and deep red, and they’ll be almost as good as if you picked them yourself. 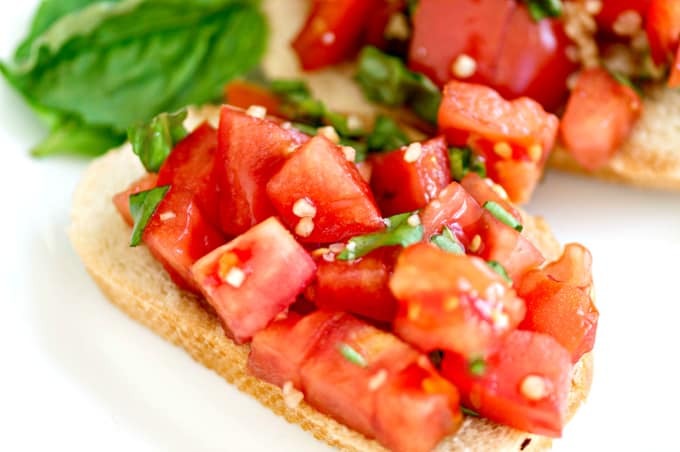 Fresh basil, not the dried stuff, is also a must in this bruschetta recipe. So is good quality olive oil and freshly minced (not bottled) garlic. As for the bread, go for a good Italian loaf or even a baguette — the crustier, the better! This simple 5-minute appetizer features a robust blend of fresh tomatoes and herbs on top of garlic-rubbed, grilled bread. Preheat the oven broiler and move a rack to about 6 inches from the top. Slice the garlic cloves in half lengthwise. Cut the bread into 1-inch slices. Very lightly brush the top of each slice with a little olive oil and arrange it on a parchment-lined baking sheet. Broil 2-3 minutes, just until golden brown. Work in batches if necessary. Remove bread from the oven and immediately rub each slice with the cut side of a clove of garlic. You can usually use one clove for two to three pieces of bread. Set the bread aside. Mince the garlic then combine it with the remaining oil, tomatoes, and basil in a non-reactive bowl. Season to taste with salt and pepper. To serve, arrange the bread slices on a platter, toasted side up. Spoon the topping onto the slices and enjoy. To make ahead of time, or for smaller crowds, serve the topping in a bowl and allow guests to add it to their bread so it doesn't get soggy while it sits. Golden Turmeric Milk – Anti-inflammatory and anti-oxidant! 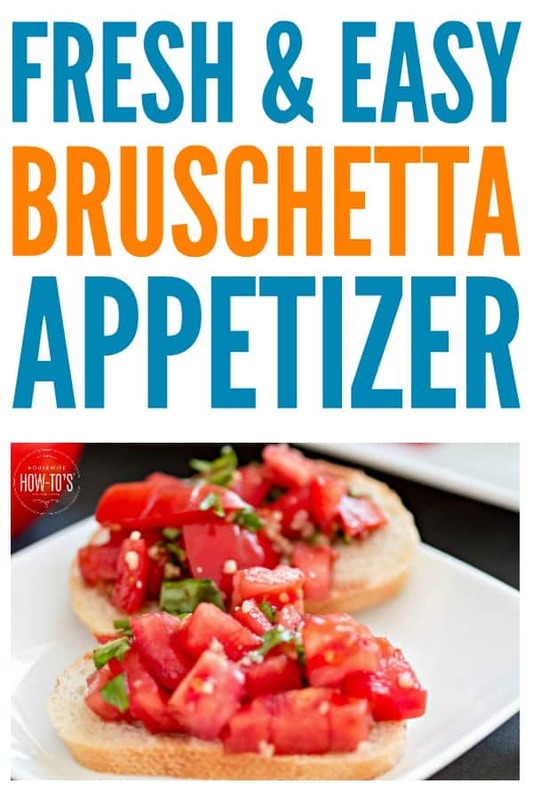 I never say bruschetta the correct way, so I’m glad to know how it’s really pronounced. Thanks for sharing that along with your delicious bruschetta recipe at the #HomeMattersParty this week. 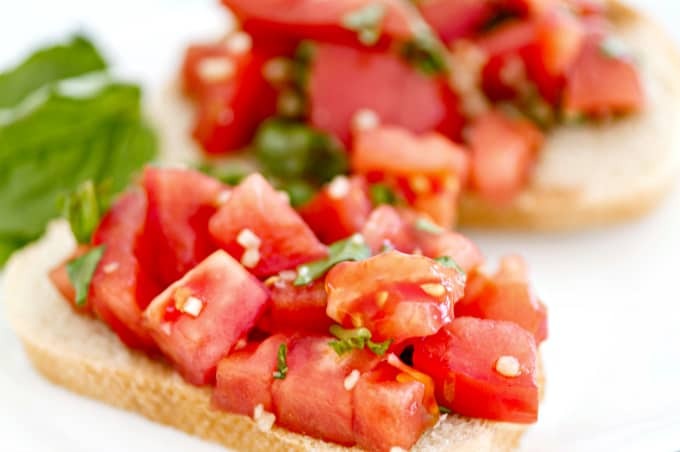 We love bruschetta especially during tomato season. Pinned & sharing. Thanks for sharing at the Inspiration Spotlight party @DearCreatives See you again soon. I love bruchetta so much! Me, too. Such great flavors! This looks wonderful. Plus I like your suggestions if there are any leftovers. No matter how you pronounce it it’s delicious! 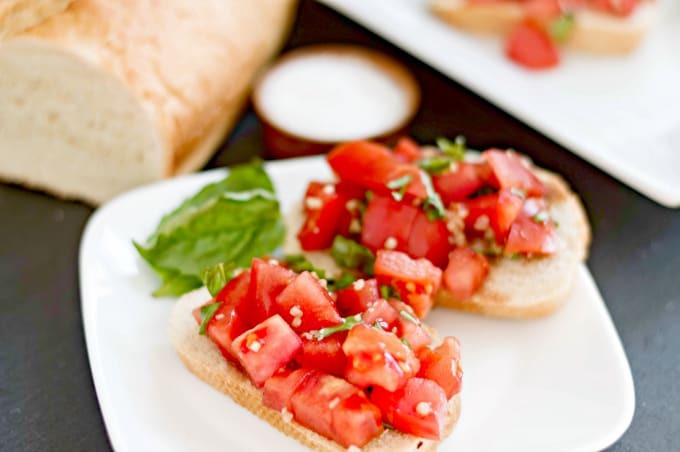 Bruschetta is seriously one of my favorite dishes! I love how easy your recipe is. Now I can start preparing this on a regular basis. Thanks for the awesome recipe! It’s such a super easy recipe, and so versatile, too! This looks delish! I’m forwarding it to my daughters, who are my bread-makers! Thanks for the recipe!